Back in the day, when I was teaching at Edina (Go Hornets), we had a building somewhere in the district that we could visit to find ‘Re Re Re’ stuff that we could take for free back to our classrooms. I remember visiting that place ONCE…and not really finding anything I liked enough to Reuse, Renew or Recycle. To be honest, I’m not super good at Renewing and Reusing…but, we do our best around here to at least Recycle! So, you green people can lay off. Our kids have fallen not too far from the tree…well, at least one of them hasn’t fallen far from MY tree. Our eldest child was the first born child, grandchild, cousin, niece… of my side of the fam…so, there wasn’t much opportunity for hand-me-downs. We also didn’t have many friends with older girls than she…SO, all this probably plays a little bit into the fact that she has never been a fan of hand-me-down clothes, shoes, coats, blankets, mittens…you get the idea. Even as a wee one, she was not a fan of second hand clothing stores or garage sales. She could smell (no pun intended) them a mile away. Thankfully, she did accept clothes from Target for a very long time. I blame ‘nature’ for this…not nurture. Last year before his first basketball season-and we had not yet discussed his footwear for this new sport- he asked me, “Mom, do you think we could just get a pair of Trey or Sam’s old basketball shoes for me to use?” I just looked at him like “WHO ARE YOU?” and told him that we could, in fact, buy him a new pair for the season. And, I couldn’t wait to buy him that pair just because he didn’t expect it or make a huge deal about “NEEEEDING” a new pair. Last week we found Will a new winter coat and snowpants as he has grown out of his “old” one. One that, in fact, was not a secondhand jacket! But, I did get it for $10 on clearance during the offseason the year before :). So, I was asking him if his old one was savable/useable for when D-Vin gets here. He was sad to tell me that there was a huge hole inside one of the pockets (all I needed to know to put it in the giveaway pile). Then, he says, “BUT…I COULD FIX IT! I can sew it up!” Again…WHO ARE YOU?…he has fallen closest to his father’s tree in this regard. It’s true, Scott WAS our resident seamstress. 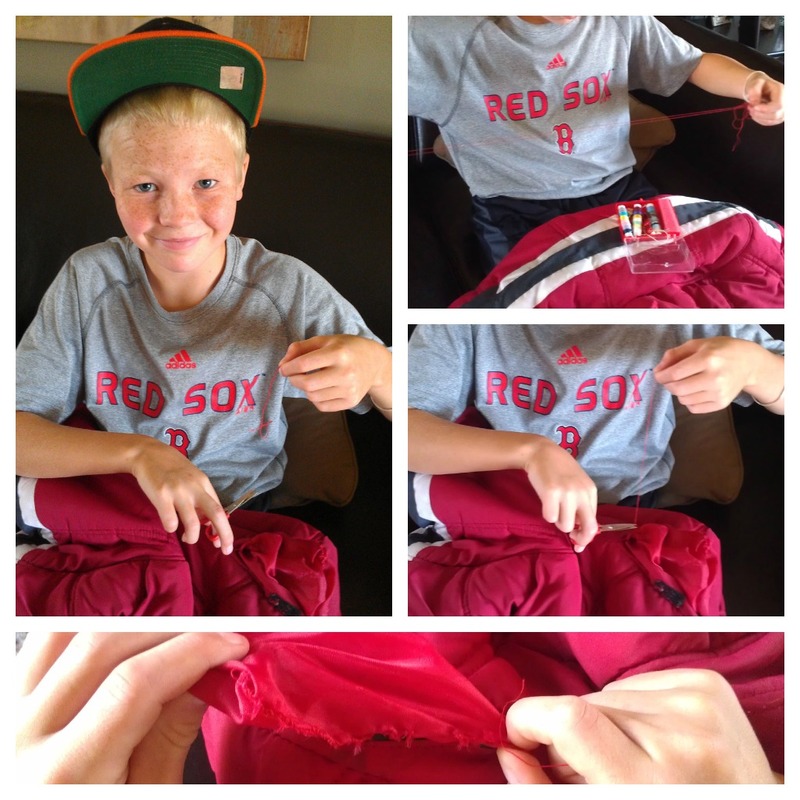 So, there sat my studly, athletic, 11 year old son in his Flyers flat bill and Red Sox t-shirt… who patiently and carefully stitched up and RENEWED that little pocket for the next 45 minutes so his Haitian brother could REUSE an otherwise perfectly good coat. Scott walked past and we just beamed at each other over the cuteness of the whole scene. He shared with Will that he was using a very cheap sewing kit which made it tougher to thread the needle and maybe we could get him a better one for a stocking stuffer at Christmas…LOL! Shout out to his FACS teacher at Skyview for teaching these boys and girls how to do it (Will told me some of the stitches he used and I can’t recall what they were). Mom, I know you are beaming with pride! Sorry, this skill skipped a generation.